4The DreamWeaver is a vibro-acoustic or musical environment. It is a sacred space where you feel as well as hear the music. It is capable of connecting your consciousness to its highest potential while deeply relaxing your body and clearing your mind. * A clearly stated Intention for well-being or change, formulated by the client with the help of the facilitator. * A womb of sound. Music is delivered directly to your body from above and below as you lie upon a vibro-acoustic mat, this enables you to feel as well as hear the music. * A copper Dodecahedron frame, holds the life sustaining frequency of prana, this sacred space, connects you to your Spirit essence and anchors it into the physical world, experienced as vitality, a fortified energy field and increased life force. How does this Musical Massage benefit me? * Body – Physically you completely relax, feel dreamy, confortable. Sound breaks up old patterns, re-establishes a sense of ease in form, you begin to feel more at home in your body. * Mind – Effortless clarity and AH Ha moments. Experience a meditative quality. Harmony gently guides you to a stillness in mental activity. When your mind is quite, you can hear your inner wisdom, all truth comes from within. * Emotions – Feel old emotions as they surface, honor all of your feelings. Realize that we are not our emotions, we are the one experiencing a response to them by thoughts we attach to events. You will feel safe to move through old emotions because so much love is generated in the session. Witness and release with ease. * Spirit – With a still mind, a relaxed body and a balanced emotional field, the power and significance of your inner Spirit is present. You are consciously connected to source energy and remember that all is perfect even in its imperfection. The ego and the higher-self merge. * Balance in body, mind and affairs. * Entire energy field is in a flow state known as laminar flow, which results in regaining personal harmony, this in turn spills into your surroundings and your daily life. Private sessions are 90 min. $140. Please contact me below and thanks for your interest in Sound Therapeutics and your personal healing. Sessions are currently Monday through Saturday at 10 am. I am also flexible if you need another time. Looking forward to working with you in sacred space. Time to let go of the past and set yourself FREE ! just wanted to say thank you for Liking my FaceBook page www.facebook.com/SoundTherapeutics We only need 100 likes to get the Specials rolling ! If you haven’t Liked it yet, come on by and see what you think, and thank you for being there. much love and many lights to you on this first day of FALL. 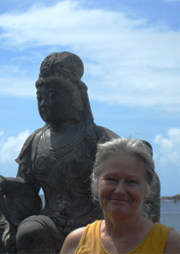 the image is of me and one of my favorite mentors, Quan Yin, at Nawiliwili Harbor, Kauai, Hi. 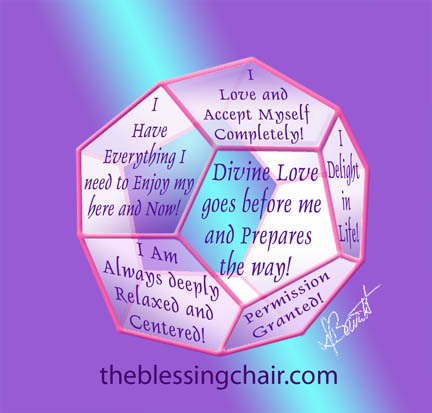 Take the time to read each of the statements embedded in this Dodecahedron. Each is specific to you. Each can put a new spin on your perspective. Because today is Friday the 13th, I thought to share some strength and to remind you that nothing is left to chance. We create it all, the good, the bad and the ugly, also the beautiful, serene and supportive. The choice is always ours. Now go out into the world, fortified with your own knowing and be ready to answer the call of your Soul and not fall into the old ‘myths’ you have been fed. It may be the 13th but remember 13 is the number of completion, and in this case the completion of the end of what was. Positalk is a word that Spirit gave me to describe this hour of positive thinking. The idea is to put a positive spin on whatever seems to be bothering you, in your way or just plain disturbing. We all have the ability to see things from a new perspective. With a little practice, you will be spinning even the most negative things in your life into a positive learning experience. Now we can get the lesson quickly and move on. Please be punctual, this is a quick hour. We will be coloring mandalas, beautiful graphic symbols often used for meditation. No artistic ability is required and all materials will be supplied. This is an especially great experience for those who don’t meditate easily but would like to feel the peace and relaxation that comes with a meditative practice. You will be writing your intention on the back of your mandala to take with you into your personal space. 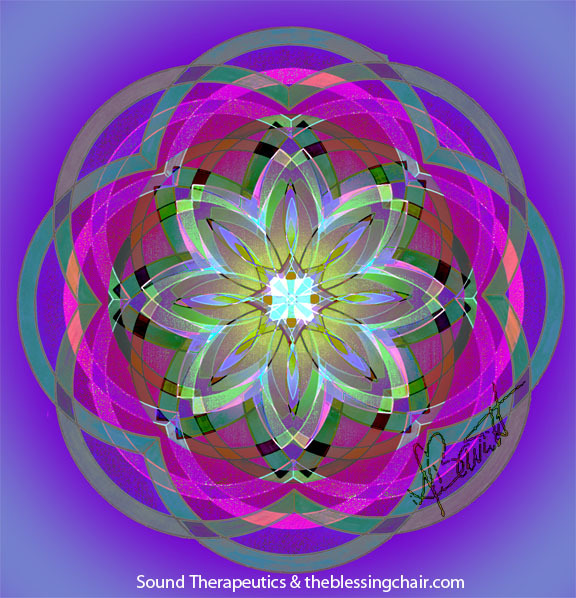 Added bonus = Once created your mandala will continue to radiate the energy of your personal intention. 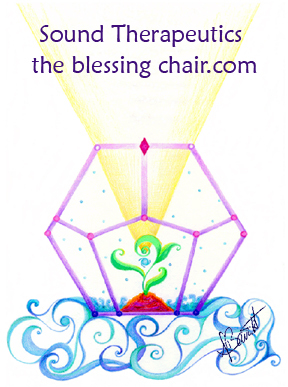 Come sit in a healing circle and send love and light to yourself, a loved one or the world. Please bring a small stuffed animal, a teddy bear works well and so does a monkey. Your little animal will act as a proxy for sending love and healing light to the desired target. No previous energy work knowledge is required. You will learn how to use absent healing as a go-to tool for relieving suffering in your world. Please join us. Looking for 4 women to experience mutual healing. This is an intentionally small group. We will be working with your individual intention for well-being. Each participant will experience time on the DreamWeaver Vibro-Acoustic sound table while the other participants take a spot on all sides of the table offering hands on healing. Reiki training is helpful but not necessary as our intention will be magnified by the dodecahedron, the music and the ‘Angels of Light and Guidance’ that have supported my healing practice since 1995. If this sounds like something you would be interested in, get together a few friends or come and meet some new partners in healing. E-mail me at debbarrett808@gmail.com The best is yet to come. Sometimes we have to consciously block out the outer world in order to enter into the place of our personal inner wisdom and wholeness. 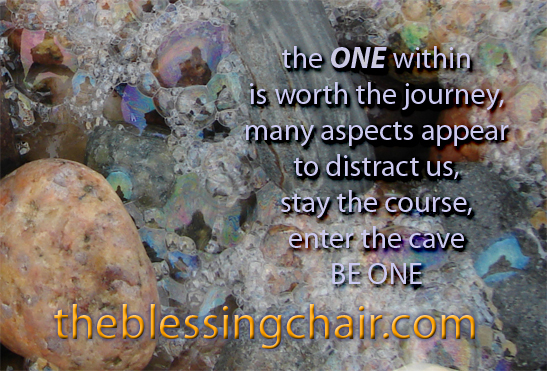 This ‘cave’ of silent knowing always exists, yet, without our intentional focus upon it, we do not find our answer. In every bubble in this photograph we see the reflection of the photographer, the viewer of life, mirrored in each and every reflection. Notice how each reflection is slightly distorted and uniquely itself yet is still the reflection of the observer. Think of all the reflections we have in our lives. Each a mirror of ourselves seen though many, many perspectives. Be still the mind and open to your heart’s knowing. Enjoy your memories of the past, joyfully anticipate your future creations and most importantly keep your focus on the NOW. The present is full of what we bring to it. So, plug into your inner light and dial up super bright. The world needs your love and acceptance, your calm strength and trust. PS the photo was taken by Jim O’Connell, my honey and photographer extraordinaire !